The turn of the 20th century proved to be a time for a revolution in communication methods. The Geat War used the most modern techniques next to old fashioned ones. 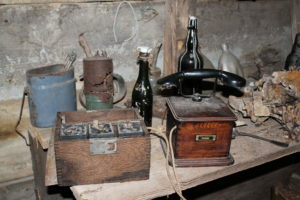 For the first time the telephone could transmit orders to where the battle was going on. It was a portable field telephone. But telephone lines could be tapped. Sometimes it was more convenient to send runners. Being a runner was one of the most dangerous jobs in the war. A robust method was to convey messages was through carrier pigeons. Pigeons were trained to fly back to their home-base at the commanding post. In the case of the United Sates 7th Dvision, a pigeon, Cher Ami, saved the lives of 194 men surrounded by German troops and under ‘friendly’ fire near the village of Binarville in the Argonne Forest. 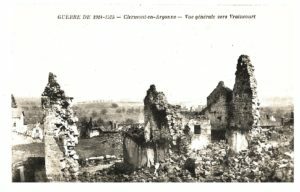 Cher Ami delivered the following message: ‘we are along the road parallel 276.4 our artillery is dropping a barrage directly on us. For heavens sake stop it.’ Cher Ami can be seen in the Smithsonian Museum. 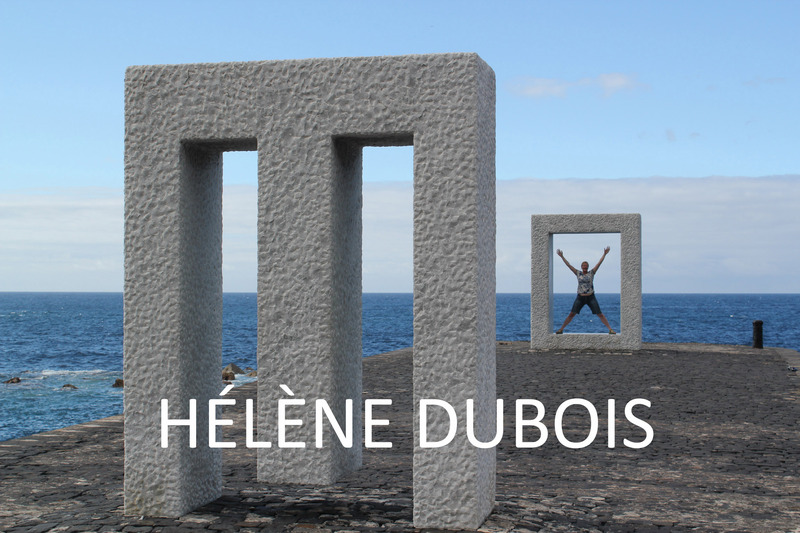 At Fort Douamont, a memorial plaque has been erected for the pigeons who served in the war. 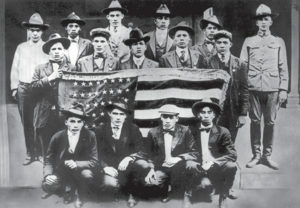 Some Choctow code talkers are among this group of men. (c) Choctaw Nation site. The most ingenious way to sent secure and coded information to the different posts, was by employing indian languages. Indians enlisted massively to fight. In: ‘The Oklahoma Spirit of ’17 (published in 1920) under the titel ‘Loyal Indians’ it said: ‘At least five thousand Indians either enlisted or were induced into the army from this state and it may be said in passing that, in almost every ease, the Indian went to war willingly and there were very few claims for deferred classification or contests over classification filed by Indian registrants.’ (W. E. Welch, J. S. Aldrige, L. V. Aldrige, The Oklahoma spirit of ’17, Historical Publishing Co., Oklahoma City, Okla. 1920, p.412.). The Choctaw code breakers of the 36th division is the first known case of using a native american language as a way to “encode” messages. 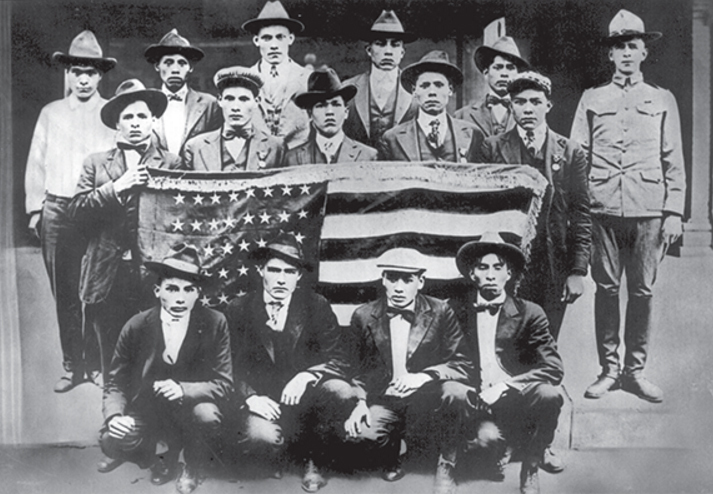 It was only after the war, in 1924, when Choctaws received the right to vote. Their success remained a secret, to be reused in World War II. Next to war communications, messages to their loved ones was a lifeline for soldiers. 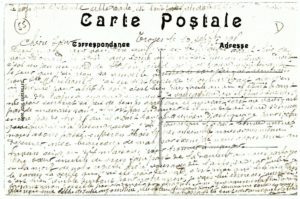 Letters from the French soldiers to home were often censured, so as to cover locations and other sensitive information. 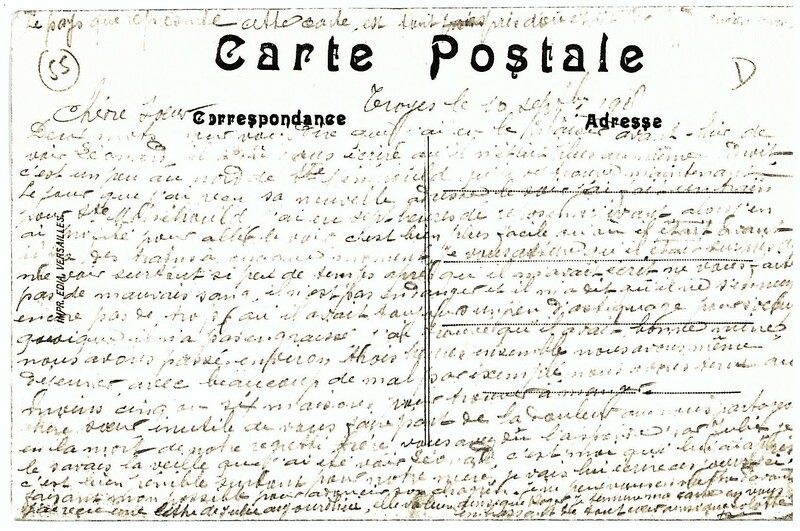 In Belgium, L’oevre du mot du soldat was a system which allowed Belgian soldiers to sent letters without betraying the exact address of the family in the occupied areas. The country that this card shows, is very close to were Léonard used to be. On the backside, in tiny handwriting with sentences pressed on top of each other and without using any punctuation, a soldier has written a letter to his sister reassuring her ‘Léonard’ was doing well and commemorating the death of their brother. Two words to tell you that I’ve had the pleasure the day before yesterday, of seeing Léonard. He must have written you that he wasn’t at the same place anymore. It’s a little to the north of St Ménéhould that he is now. The day I received his news, after having seen him, I took a train to St Ménéhould I had seven hours of rest on arriving so I made use of the occasion to go and see him it is a lot easier than it used to be. Though he hasn’t gained weight I found him to have a good countenance we have spent about three hours together we even had lunch with a lot of difficulty for example we had to call at least five or six houses to find something to eat. I finish my letter embrassing you too with all my heart.